Schools are back and that means school buses. 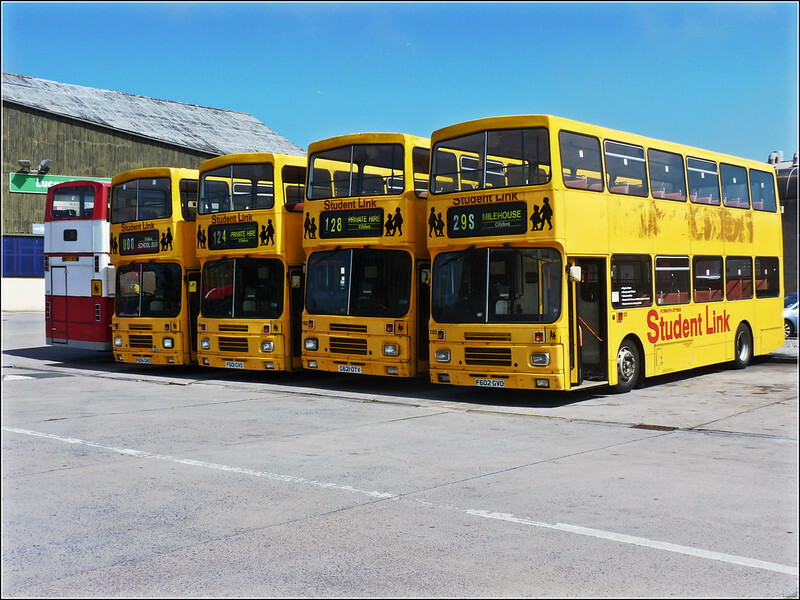 Plymouth Citybus originally planned to withdraw their school services but of course changed their mind so that means the old yellow Student Link fleet is back out on the road. It really was looking like July was their last outing with Citybus but they are still going strong. They may be popular with anoraks like myself but I know some passengers at Derriford were moaning when one turned up in service today. They cant survive for much longer surely? We see 177, 182, 184, 185, and 187 below back in July at Milehouse. Is it just these five left now? Can anyone confirm status of 178, 181 and 186 which are on my records as still being around? 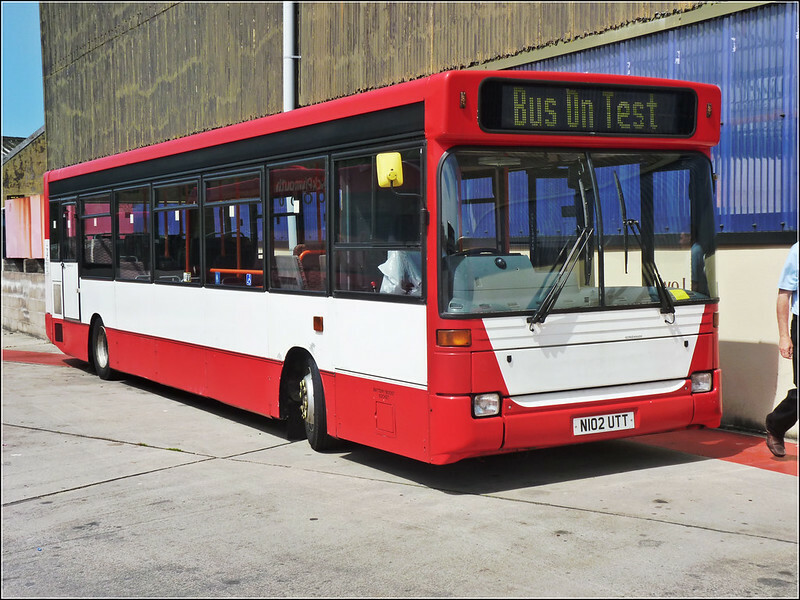 Another batch of buses which are still plodding on are the original low floor Darts the first of which were withdrawn on the arrival of the new Volvo B7RLE fleet. Number 2 was being prepared for service again back in July when caught it on camera at Milehouse and is now back out in service. There are all sorts of rumours of second-hand or even new double deckers heading towards Plymouth sometime in the near future for the planned network revamp which looks likely to happen early November at the moment, so its hard to see these buses seeing out the full year but then we have been forecasting the death of the yellow fleet for several years now! Seen yesterday on service 16 was East Lancs Volvo 408, now out of the fireworks wrap and wearing yet another version of the 'swooper livery'. Front and lower part of red, white stripe then a blue to the top and rear. Shade of blue is not too different to that worn by 55+56 whilst in the City College colours. I've managed photos of 181,182, and 187 and saw another three turning into North Road East. A very nice driver I had on 187 on the 28B on Monday said theyre supposed to be staying for another year though he didnt say if it was a calendar or academic year. We then went onto have a chat about how brilliant ths B10Ms are - the majority of drivers much prefer them to the B7s! Saw 177 on driver training duties too. 186 was in service yesterday morning on school service 127. There is also a dart in the spray shop. There will b a dart done in city college livery too. bus 2 back on road after head gasket replaced. both 177/178 still going. Volvo D10M deckers 177/178/181/182/184/185/186/187 are all still in service at the moment! 143 is the latest enviro to wear the revised livery. Thanks - thought there was one more out there!